This week’s episode features Coach Randy & Adam D as they begin their podcast journey. 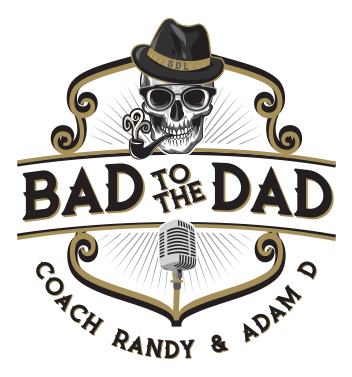 Get an idea of what Bad to the Dad means and how you can be Bad to the Dad. We also feature our first guest dad – Chris Diaz. A dad extrodinare, blogger at http://www.WineWithCheetos.com, amazing spouse and a professional attorney by day. Great stuff guys! Congrats. Erica and I taught birth classes for years and one of the best parts for me was working with the deer in the headlights guy and watching him prepare to and become an awesome dad. I would have LOVED to share this podcast with them in that processes. These stories normalize fatherhood and hearing them as a new (or about to be new) dad helps remove the fear. Being an involved and engaged dad is cool…..cool enough for a podcast!